"The Music They Played on 7th Street Oakland" needs repairing — and Ronnie Stewart is fighting for it. Plaques honoring blues musicians who played in West Oakland don't gleam quite like they once did. Fillmore Slim, the Oakland Blues Divas, Guitar Mac, and several other longtime blues artists gathered at Yoshi's earlier this week with a common purpose: to preserve the musical history of West Oakland. Ronnie Stewart, the executive director of the West Coast Blues Society, recalls the days after World War II when 7th Street in West Oakland was a hub of entertainment — full of supper clubs, jazz clubs, and other venues where you could regularly hear blues. In fact, a distinctive West Coast blues style emerged — "a blues without harmonica and a more laid-back sound," Stewart said — as well as an Oakland blues style, which is slower and more mournful. Stewart has been championing the sound and preserving the history of Oakland blues for more than two decades. He's seen some success in preserving that history in the face of an ever-changing city. In 2015, the West Coast Blues Society created "The Music They Played on 7th Street Oakland," a walk of fame commemorating the era, in front of the West Oakland BART station. According to Stewart, the project cost more than $200,000, made possible through the city of Oakland, Bay Area Rapid Transit, and private donations. In total, there are 88 brass plaques — the number of keys on a piano — that decorate the sidewalk honoring those who once played in West Oakland. Names like Aretha Franklin, Etta James, Nat King Cole, and Billie Holiday are included along with local legends like Samuel Saunders King, the first blues musician to make it big from Oakland. Last year, filmmaker Cheryl Fabio (daughter of overlooked creative genius and West Oakland native Sarah Webster Fabio) created the documentary Evolutionary Blues...West Oakland's Music Legacy, not only aiding in the preservation but proving that there is still growing interest in the sound and the history today. "The state of blues in Oakland is bad," Stewart said. "We should be trying to keep it alive." As interest has grown, it's become especially disheartening for Stewart to see the plaques he fought so hard for fall into disrepair from neglect. They've become oxidized and rusty over time, and the West Coast Blues Society does not have the funds to cover the costs of upkeep. Stewart organized his recent fundraiser show at Yoshi's in the hopes of collecting enough donations to pay for cleaning, as he also did for the first time last year. But is it even the West Coast Blues Society's responsibility? It's unclear. "The reason we have to do fundraisers like this is because no one knows who would approve the cleaning," Stewart said. Yet, over the course of the Express reporting this story, the city clarified that it might work with Stewart on this project after all. A week before the fundraiser show, Stewart said he was finding himself in a bureaucratic cul-de-sac. Though the plaques are on BART property — and were made possible with the help of their donation — no one there will claim them. 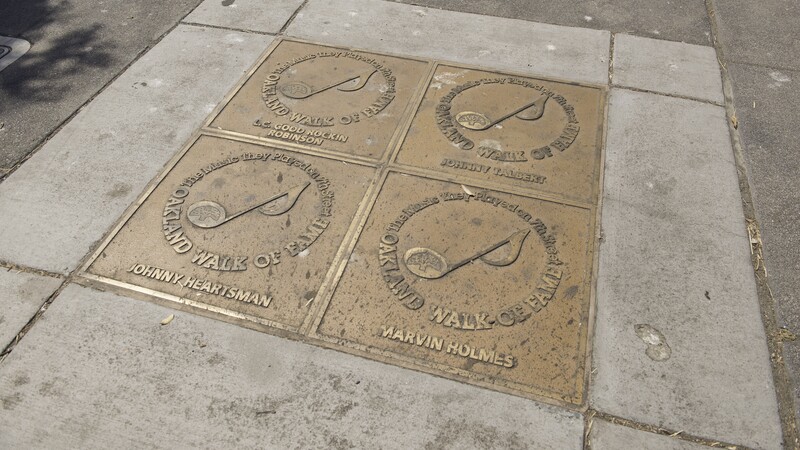 (Jim Allison, media relations manager at BART, said that BART considers the sidewalk where the plaques live to be property of the city of Oakland.) Karen Boyd, communications director of the City of Oakland, turns out to be a major fan of Stewart. She told the Express that she believed the funding for the walk of fame came through Oakland's public arts program, which pays for the making of the works but not the upkeep. But she also said she'll get in touch with Stewart to make arrangements to help with repairs and upkeep. A few days later, Stewart said he has, indeed, heard from Mayor Libby Schaaf directly. "The mayor had informed me that maintenance is pushed against the wall and had a full schedule," Stewart said. From Jimi Hendrix to the Rolling Stones to the Black Keys, the blues have proven to be a timeless musical form that also changes with the times. It's easy to forget the origins of a sound that now permeates so much of the contemporary American music in our daily lives. This is especially true about the many nuanced forms produced by different cities all over the country. There's the Memphis blues, characterized by distorted electric guitar and booming drums. There's the Kansas City blues, exemplified by Big Joe Turner with an up-tempo and brass instruments. Then, of course, there's the West Coast blues and Oakland blues. There may be few venues left in Oakland to regularly hear live blues bands, but Stewart is thrilled his blues-driven bureaucratic nightmare might be coming to end soon.